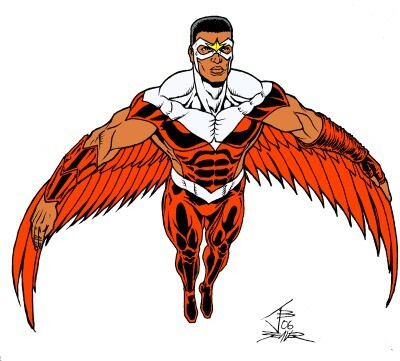 The Falcon has been one of my favorite 'teammate' characters since the Gruenwald Cap run and even more with the great characterization Geoff Johns gave him in Avengers. I was too broke to get Priest's Cap & the Falcon, but it's in the top 5 of my "books I should've gotten while they were being done and must now track down while I'm still alive" list. I coudln't dig out any Avengers issues that had all the outfit details, so I had to go online to find a CAandF cover to get the left glove detail. Really, I couldn't tell if it's supposed to be a glove or handwrapping, so I just drew it as a glove as otheres seem to have done. Pic #10 of 2006.